Remote facilities are more than resource extraction sites. They are revenue-generating assets and vital hubs of business activity. Although geographically distant, remote sites are the core of your business. And because they can drive or derail your profitability, remote operations need to be connected to the centre of your corporate network. 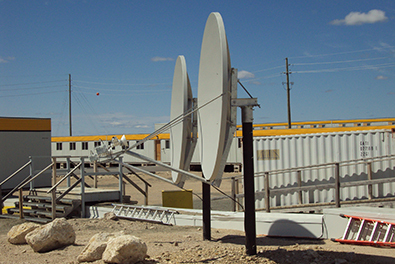 Infosat eliminates the distance barriers by providing large bandwidth connections to your most isolated locations. Our voice and data connections make a remote site as accessible as the office next door – even if it’s half a world away. Infosat can also help bolster employee morale. The bandwidth that is dedicated to the corporate network during office hours can be reassigned to employee personal use in the evening. Viewing Facebook pages and making Skype calls can help keep your workers feeling connected to loved ones back home. What Are Your Remote Office Support Needs? What is the business activity of the facility? How many employees work in the office and in industrial roles? How many office computers need links to the corporate network? What software applications do the computers need to connect with? What wireless network coverage do you require? How many phone extensions are needed? What other voice communication systems will you use on site? What Internet access is needed to support worker morale? Infosat has more remote office communications experience than any other company in the industry. We have been setting up remote office installations and keeping them connected since 1986. In addition to supporting the largest remote offices in northern Canada we have designed and installed satellite communication systems for facilities in South America, Africa and the Middle East. Our field technicians have pretty amazing photo albums. They have pictures of northern lights, grizzly bears, desert sands and the lemurs of Madagascar.